ABC Indigenous Australia is an offshoot of Australia’s major ABC network. ABC’s aim is to provide a platform for which Indigenous creatives can develop, be supported and fund their initiatives. Founded in 1987 and inspired by the former works of the Indigenous Programs Unit, ABC Indigenous Australia’s mandate is to provide a Indigenous voice to mainstream and primetime broadcasts. What I find interesting about this project is that even though the organization boasts an Indigenous voice, it’s products are not fully autonomous Indigenous productions. As such, it puts into question the motives and intended audience. In other words, are these productions meant to entertain and educate primarily white audiences – if so, is this appropriate? Below I have posted two clips and press from the highly recognized sketch comedy series ‘Black Comedy‘. In this week’s activities, I have come across some wonderful sites that bring some insight into this week’s readings. The focus in this case will be close to home for me as I work in a community that is primarily Aboriginal in northeastern Ontario. As new educators come into the community, and as new technology options become available, it is important that these be shared with students. Anecdotally, it has always been a concern of parents and students in the area that as a result of colonialization and residential schooling, much of the local culture and language has been lost. There exists a need to work to re-acquire this connection with language which in turn will help with re-acquiring culture. This is a resource that was developed in 2009 by the Ministry of Education in Ontario. The focus of this toolkit is to support teachers in Ontario by providing opportunities for teachers to bring more Aboriginal teachings into their classrooms. Supports are in place to utilize technology options for creating a stronger sense of identity and positive self-image for FNMI students in the system as well as sharing some of the cultural teachings and histories with those who do not have an FNMI background. This resource was developed for educators and students who fall into the Treaty 9 territories in Ontario. Taking on the role of a character living in the lands of the Mushkegowuk and Anishinaabe Peoples, those taking part will encounter elders who will share oral histories of the area and peoples. Along the way, there will be opportunities to learn words and meanings from the Mushkegowuk Cree dialects. This game is appropriate for any level and is beneficial to learn some of the teachings that may otherwise be lost. This is a dictionary that was created by current and former members of the Moosonee and Moose Factory area. It has been in use recently by the Cree-language teachers in the area schools as a means of teaching students the proper pronunciations for the Moose-Cree dialect. This is the first time the Moose Cree language has been made available online in a manner that allows for full practice and creation of sentences. As well, not only is the language online, so are the syllabics to help write it out (despite the Moose Cree language being traditionally oral). Have a look and see. I apologize that this film has to be purchased, but I swear it is worth it! It was created by a filmmaker from Moose Factory into how the Mohawk community of Akwesasne is using technology and immersion as a means of preserving language. Unlike most schools that focus on grammar and practice, this school instead focuses on the true immersion into traditions and identity preservation. If you have a chance to watch it, I recommend it as it is setting a blueprint for the renewal of the Cree language in the Moosonee and Moose Factory areas. This site is one that I have found that shows the effects of colonialism and re-discovery of aboriginal cultures is not isolated to solely Canada. In viewing this resource, which was started by an Australian teacher, it is evident that it has a wealth of resources available to Australian teachers (and those who wish to learn more about Australian Aboriginal peoples). Through the sharing of files, posts, and media, it brings a wealth of pieces that can come together to create a fuller picture of the re-discovery and preservation of Australian Aboriginal cultures. Cape Breton University. (n.d.). MIKM 2701: Learning from Knowledge Keepers of Mi’kma’ki [Course Description]. This course answers calls from the Truth & Reconciliation Commission (to incorporate Indigenous knowledge and perspectives into higher education curriculum) by sharing the “history, culture, and wisdom of Indigenous peoples in Mi’kma’ki and across Canada.” It is offered for-credit or for general interest to the public. Classes from the Winter 2016 offering were live webcasted and then archived online. Indspire (n.d.). K-12 Institute: Successful Practices. This Canadian Indigenous-led registered charity includes 1000 resources in their online resource centre for Indigenous education stakeholders. Proven practices in the form of research, models, frameworks and educational strategies are shared for K-12, across subjects, provinces, grade levels, topics (e.g., online learning, holistic learning practices) and Indigenous affiliations. Koissaba, B.R. (2014). E-learning principles and practices in the context of Indigenous peoples: A comparative study. Cultural Survival Quarterly. This article is published by Cultural Survival, an organization that “advocates for Indigenous Peoples’ rights and supports Indigenous communities’ self-determination, cultures and political resilience” (Cultural Survival, n.d.). The article highlights cases of e-learning in Indigenous communities from Australia, Kenya and the United States, and includes recommendations to develop e-learning practices that better serve the needs Indigenous communities. Reedy, A., Gulwa, H.W., Charles Darwin University, & Marmaruni School. (2016). Online learning and teacher education: The experiences of Indigenous teacher education students. Learning Communities: International Journal of Learning in Social Contexts, 20, 40-51. This article looks at the needs of Indigenous post-secondary students taking online courses in Australia. The data was collected through “yarning,” a conversational research method, and a research study into the experiences of Indigenous post-secondary students in order to inform the design of online learning environments. The University of British Columbia. (2017, February 21). ‘The little MOOC that could’: Online course promotes Indigenous ways of knowing [Media Release]. This is a media release about a massive open online course (MOOC) that introduces participants to indigenous histories and worldviews and shares teaching tools on indigenous education. The third offering ran in Winter 2017 with 8,200 registrants (mostly educators), and the next offerings are slated for Fall 2017 and Winter 2018. 2002- Agreements, Treaties and Negotiated Settlements with Indigenous Peoples in Settler States; their Role and Relevance. 2006- The Implementation of Agreements and Treaties with Indigenous and Local Peoples in Postcolonial States. 2010 – Poverty in the Midst of Plenty: Economic Empowerment, Wealth Creation and Institutional Reform for Sustainable Indigenous and Local Communities. In addition to this research, the site includes a plethora of information relating to agreements that have been made between indigenous peoples and governments in Australia and globally. One particularly useful feature is a Latest News feed, which provides “land-claim” related stories from around the world. This feature is useful because in addition to the link, it provides background context and a short summation. ATNS also hosted a major symposium in June of 2013 focusing on indigenous and land claims issues in Australia. Many of the conference sessions are available for online streaming. Topics include “Co-management: agreement making for Cultural and Economic Sustainability” and “Getting the Benefit from Delivering Benefits: Relationship Building in Native Title Negotiations”. The ABC Indigenous Portal is a fantastic site that collects and distributes Aboriginal & Torres Strait Islander stories from around Australia. In conjunction with the Australian Broadcasting Channel, this site offers stories and news features in a variety of formats from radio, news, tv, and more. The reporters are Aboriginal and the stories and reports are all on Aboriginal issues, news, stories, ect. While surfing around I found a site created by the Miromaa Aboriginal and Technology Centre to aid in educating people about a number of native aboriginal dialects in Australia. 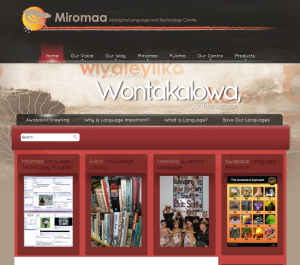 This website is a great example of how the web can help aboriginal groups save and share their languages. It includes many blended resources such as a Youtube channel, saved voice clips and educational based resources to help learners and teachers alike. The site is very well designed and pulls your into it. I found myself spending more than a few minutes there and really felt engaged. The site does a great job in connecting people to the material and encouraging them to learn more. Living Knowledge is a website created by the Australian Research Council during a 3-year research project concerning Indigenous knowledge in science education. Their project aimed to create school and community-based workshops for students, as well as this website filled with online resources for teachers, students, and researchers. While this research project focused on Australian Aboriginal groups, I felt that this website would be great to peruse to provide a basis for my research, or perhaps to compare to Canadian Indigenous science education practices. This model is very interesting for a number of reasons, but I think of most use in a course like our own, is the page they’ve developed to share Resources & Lime Publications. On this page, the LIME network shares resources which include a collection of videos/curriculum frameworks and “good practice case studies” (much of undergraduate medical education is currently taught through case-based or problem-based learning).